PLOT SUMMARY: Ten years ago, Jude and her sisters Taryn and Vivi were stolen away from the human world and brought to Faerie. Raised by her parents' murderer, Jude has grown to consider Faerie her home, even if, as a human she will always be viewed as an outsider. Determined to prove her worth and earn her place in the High Court, Jude gets tangled up into a complex web of enchantments, half-truths, and murder, as the High King's children anticipate their father's abdication of his throne to one of them. After all, as a human, Jude has one skill the fae do not: she can lie. In the game of politics, that makes her invaluable. FIRST THOUGHTS: If you're an active part of the online bookish community, you've probably heard this book hyped up a lot recently. 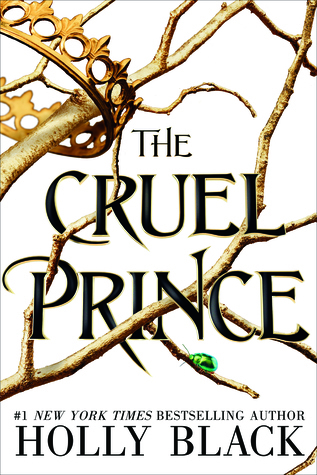 It's easy to see why; The Cruel Prince is the first in the Folk of the Air trilogy, and it's by a pretty popular author. So, you may be wondering, did it actually deserve the hype? Well... yes and no. The things everyone was raving about were the things I wound up not liking so much, but the things I ended up really liking about the books were the things no one mentioned at all. At least, not in the reviews I read. (And I admittedly avoided digging too deep, for fear of spoilers.) That said, I really enjoyed this book. It's the first thing I've read by Holly Black, and she didn't disappoint. THOUGHTS ON PLOT: Okay, so the annoying thing is, the things I liked most about this plot are huge spoilers, so I can't go too deep into it. I will say that I loved the political aspect of the plot -- it's like House of Cards with fairies. (I've also seen it compared to Game of Thrones, but I've never watched or read that, so I'll let you be the judge.) There are a lot of plot twists, and starting in the last hundred pages or so, they hit you approximately every three seconds, so be prepared for that. And the ending... AAAAAAGH. There are literally hundreds of directions the story could go from here. My first thought upon finishing was, "Okay, now I have to know." So, congrats, Holly Black -- I'm definitely buying book #2. THOUGHTS ON CHARACTERS: A serious mixed bag. I really liked Jude; she's an extremely morally grey protagonist, and she knows it, but she's very strong, capable, and likable in spite of her... many, many flaws. I was also surprised by how much I liked Madoc, Jude's adoptive father/murderer of her parents. Madoc is not a good person by any stretch, but he's a very compelling one, and he and Jude have a fittingly twisted relationship. They love each other, but don't let their guards down around one another for a minute. Their dynamic was incredibly fun to read, and I hope we see it develop in future installments. I also really liked the side characters of Dain, Vivi, and a few characters that I can't mention because their very existence is a spoiler. So, that's the good. Now. The bad. My main gripe with the characters is Cardan, the titular prince. He's every bit as awful as the title implies, and then some. Seriously, I genuinely hated him. Though maybe part of my antipathy can be attributed to the fact that, going off reviews, a lot of the readership seems to love him for some reason. Like, you do you, but... I don't get it. (And I will admit, people claiming Jude is "unlikable" but then turning around and swooning over Cardan does drive me a little crazy.) As a hero (or even an anti-hero), he's just too awful to be likable. As a villain, he's just too... meh. I'd go deeper into why I dislike him, and his dynamic with Jude, but then I'd be getting into spoilers. (I may do a spoiler-filled column on this book later. Let me know in the comments if you want to see that.) Here's hoping he'll win me over in the next two books. THOUGHTS ON WRITING STYLE: The one part of the hype I 100% agree with is that the writing in this book is absolutely beautiful. This is the first thing I've read from Holly Black, so I don't know how it stands up to her other work, but I deeply enjoyed her prose here. Even the slow-moving parts of this book were wonderfully written, and kept me hooked, even when I wanted to slap a few characters (okay, Cardan) in the face. THOUGHTS ON POLITICAL STUFF: Save for one queer major character -- Jude's sister Vivi is bisexual and has a (human) girlfriend -- there isn't much to say about this aspect. I did like how Jude didn't fall into emotionless action girl syndrome; in fact, she's a pretty emotionally-driven character, which is a nice change of pace compared to a lot of fantasy leads in YA. However, other than that, there wasn't much diversity in this book at all. It wasn't offensive towards any minority groups, though, so there's that. That said, I did like the matter-of-fact portrayal of Vivi's bisexuality, and I hope she and her girlfriend get more pagetime in the rest of the trilogy. FINAL THOUGHTS: The only thing I'm regretting is the fact that I now have to wait a year for the next book in the series. While I do have my issues with this book, I deeply enjoyed it, and I'm eagerly looking forward to the sequel. It doesn't quite live up to the hype it receives, but few things in life do. Again, I'm highly considering doing another post about this book where I get more into spoilers, so let me know if you want to see that. 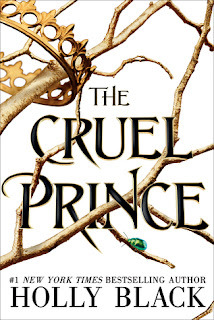 If you've read The Cruel Prince, I'd love to hear your thoughts in the comments below!